Our team of paintballers opened Combatzone Paintball games back in 2001 when paintball was relatively new to Ireland. Over the course of the next fourteen years we expanded our venue to 25 acres of some of the most action packed paintball missions that delivered great days out to thousands of groups from all over Ireland. In 2014 we decided as a team who are passionate about the outdoors and adventure that we would build an action adventure park like no other in Ireland. We knew this adventure park would need to appeal to people of all ages and the activities had to be unique. We wanted to create a place that would deliver unforgettable days out and not a place where people visit once a year but a place where people visit multiple times a year to play many different outdoor activities and every visit becomes better than the last one. To say we researched what activities we needed to have in our park is an understatement, we traveled to the US and throughout Europe to make sure we were ahead of the curve in finding new and exciting outdoor activities. On March 25th 2015 Combatzone paintball games will officially become Basecamp Action Adventure Park and our 80 acre action adventure park will open offering Splatball, Paintball, Forest 3D Archery, Bushcraft and Survival. Basecamp will have something for every type of group including Stag parties, kids birthday parties, school tours and company outings. We have trebled the size of our Basecamp and designed it in a way that will ensure it is the heartbeat of our park. We have installed chill out areas, new change facilities, shop and food facilities and a sound system fit for a festival! We have even built a designated kids basecamp separate to the main basecamp which is ideal for kids birthday parties. Given that paintball is what we do best and with over 14 years experience of running Ireland’s number 1 paintball venue we made sure that our paintball experience remained the most challenging and entertaining by revamping all our movie set missions and upgrading all equipment. We have also started offering groups the choice of playing exclusively among themselves which has added greatly to the paintball experience. We have also lowered the age limit to play paintball to 12 years of age which is a massive boost to the 12-15 year old age group that have been hoping for this to happen for a long time. 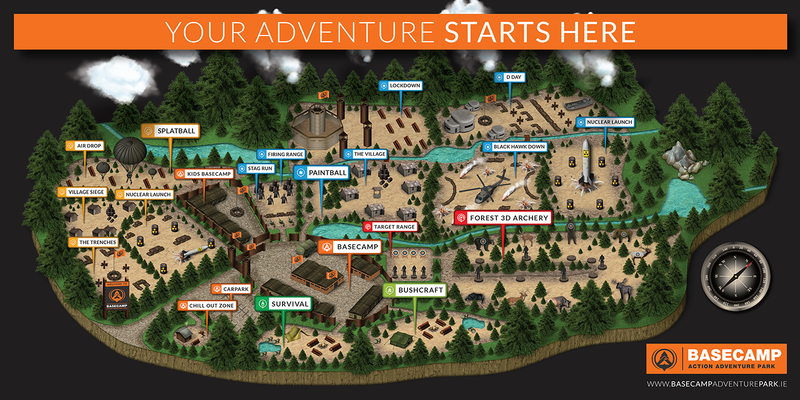 Our Forest 3D archery experience is like no other. 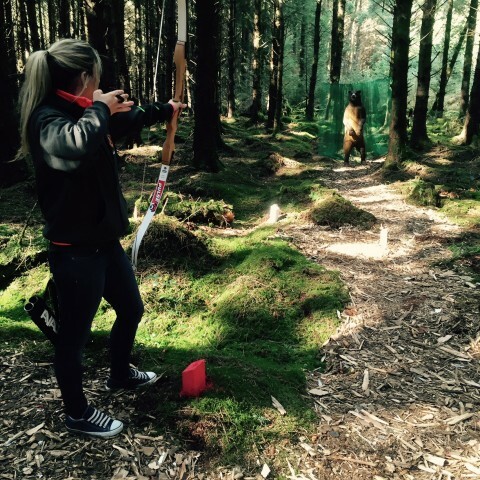 We built an 18 target forest archery course containing 3D targets such as bears and dinosaurs at every target. Each target is set at various distances to ensure all skill types can take part. This is truly an activity that will blow your mind and ideal for family days out. Splatball is Ireland’s newest and most exciting activity for kids that has taken the US by storm. The 2 hour experience is played in a purpose built forest area with movie set missions that will ensure kid’s experience a day out they will never forget. Splatball is a lower velocity version of paintball and is often the game of choice for families, hen parties and younger groups – ideal for kid’s birthday parties or school tours. The Bushcraft experience at Basecamp gives adults and children the chance to get back to nature in some of the most beautiful woodland settings. Set deep in the forest our expert bushcraft instructors will teach groups the ancient outdoor skills of shelter building, fire lighting, water retrieval and purification along with the basic outdoor survival skills. Bushcraft days can be tailored to suit all ages from 10+ and is fast becoming the new school tour or company day out. Our Survival experience is a Specialist training course based on special forces training designed to teach key skills for survival and self rescue in wilderness environments. Designed for all levels of fitness and experience this course is a must for all outdoor enthusiasts who want to develop their skills and understanding of outdoor living. Basecamp action adventure park is now open and we cant wait for you to experience the thrill. See you soon!